I’ve been dipping more and more into haircare lately, as I’m on a quest for the perfect swishy hair routine. This means trying lots of new hair styling products and finishing sprays to give my locks that softer, shinier, glossier appearance. 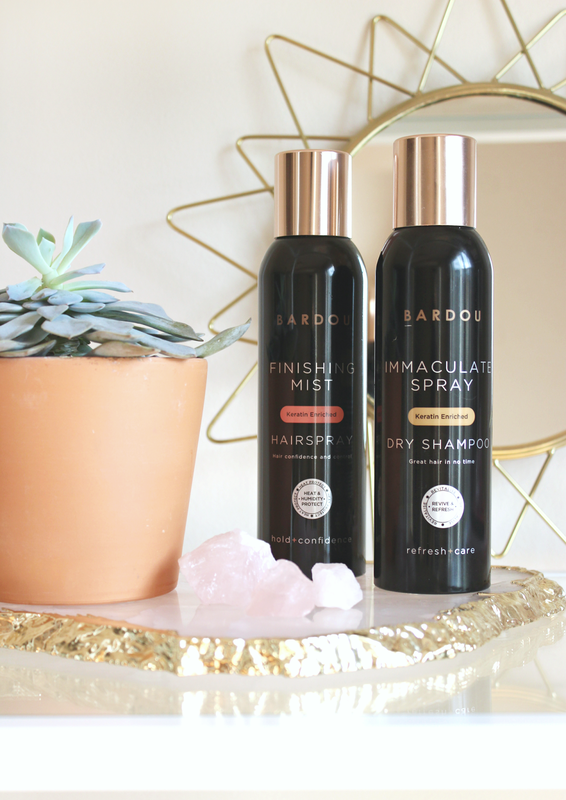 Bardou is a luxury haircare and cosmetics brand that I only recently discovered – and I have to say, I was so impressed by the products sent to me that I had to share them. I was sent two products: the finishing mist hairspray* and the immaculate spray dry shampoo*. Both of the products feel extremely light and leave your hair feeling extra swishy. The dry shampoo is the perfect second day hair pick-me-up and the hairspray helps maintain that glossy shine with a medium hold finish. I like to use them one after the other for a more polished look after a good blow dry. Each product is enriched with keratin within their formulas, so both are extremely nourishing – especially for dry hair like mine. They smell incredible! There’s a really luxurious feeling to the scent and the packaging, even though the products themselves are very budget friendly. Each spray comes in a sleek black can with 200mls of product, topped with a gorgeous gold lid – it’s definitely a product that would look extremely elegant on your dresser. I really want to try more from the brand – I think that the texture mist is definitely next on my wishlist! A Few New Beauty Finds. Trying Out Bobbi Brown Skincare. Previous Post Four Happy Things. Next Post Let’s Talk Glossier.